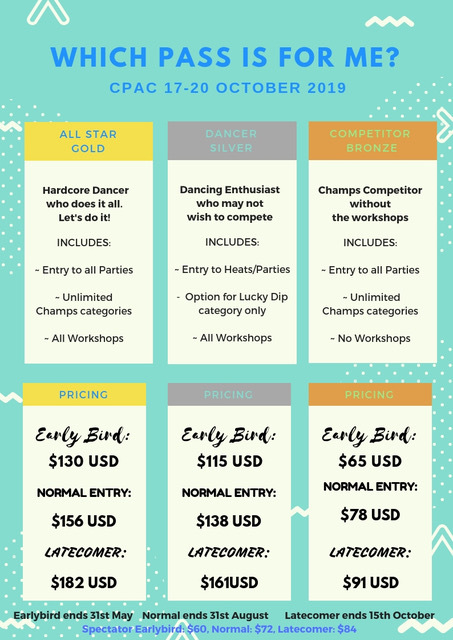 Looking for a partner for a workshop or competition heat? We recommend you post on our Facebook group that you are looking for a partner and/or contact potential partners via Facebook. CPAC organisers will do their best to match partners up for the category 'Asian Connexion’ only. If you would like help for this category please mention this on your registration form. Bookings and accommodation: non-refundable, can be reassigned to another dancer. Ceroc Asia sponsors 2 Volunteer Passes each year for those in financial hardship. In return for complimentary entry you help out at the events for free and can compete in up to 3 categories. For details please email dance@cerocasia.com and tell us why you would be eligible for this pass. If you are a qualified Ceroc Teacher please email dance@cerocasia.com to receive your discount code. Registration closes: 15 October 2019.